“Perfection? Hint: It’s Warm and Has a Secret”. 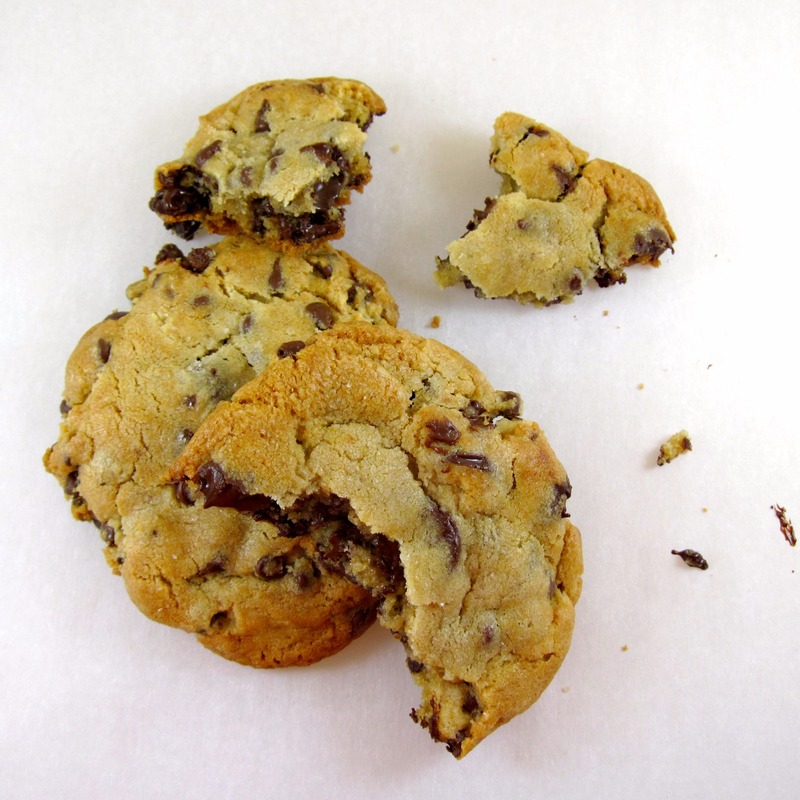 Thus began David Leite’s July 9, 2008 New York Times article about his quest for the perfect Chocolate Chip Cookies. I’m here to tell you that I think he did develop the perfect Chocolate Chip Cookies recipe. I remember reading the article three years ago. I was impressed with all of the research he had done. 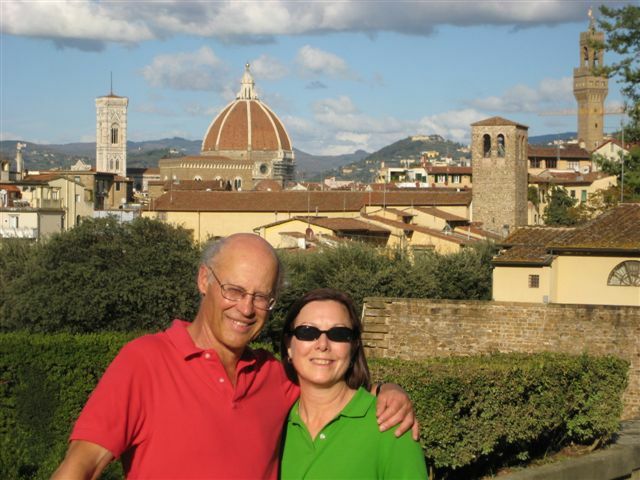 He spoke with many experts, including Maury Rubin, Dorie Greenspan, and Jacques Torres. Leite also learned that the cookies must be large. 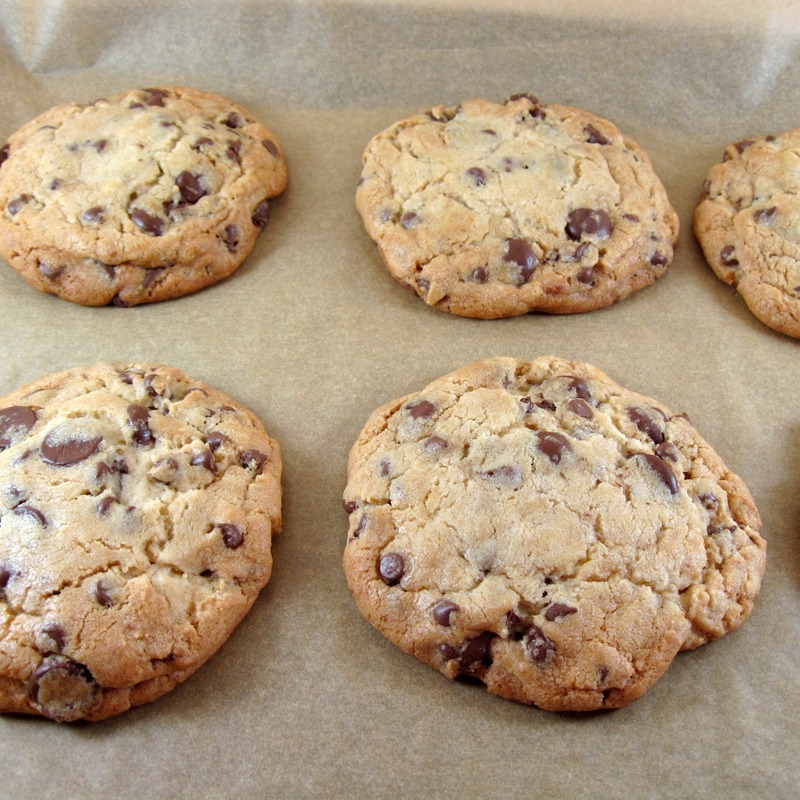 A large cookie develops a crisp exterior and a soft interior. It is perfection. I saved the article. I read about other people who praised the recipe. And I noticed that Amanda Hesser included it in The Essential New York Times Cookbook. I finally got around to making what I call The New York Times Chocolate Chip Cookies. The time was right, since Carrie was home to help me make them, and eat them! If there is a better chocolate chip cookie recipe, I haven’t found it. These are definitely the best chocolate chip cookies I have ever made! Don’t omit the sprinkle of salt before baking (like I did on one batch). It adds a wonderful dimension to the cookies. If you’re an advocate of moderation, these cookies are large enough to share with another like-minded person. After tasting them, though, I’d be willing to guess that you’ll just get another one to split. You might as well just eat the whole thing! I did follow the recipe’s advice to use a combination of cake flour and bread flour. You certainly could try it using all-purpose flour. I suspect that the results may not be quite the same, but the cookies will probably still be delicious. * I used what I could find at my supermarket: One 11.5 ounce bag of Ghirardelli 60% Cacao Bittersweet Chocolate Chips and 8.5 ounces of Ghirardelli Mini Semi-Sweet Chocolate Chips. (I didn’t realize they were “mini” until I opened the package.) The cookies were fabulous! Next time I’ll probably use all bittersweet chocolate. The point is this: use the best chocolate you can find and afford. Your cookies will be wonderful! 1. Put the cake flour, bread flour, baking soda, baking powder, and course salt in a bowl. Stir or whisk well to combine. 2. Beat the sugars and butter together in a mixer on medium speed for about 5 minutes, until light and fluffy. 3. Add the eggs, 1 at a time, mixing well after each addition. 5. With the mixer at low speed, add the flour mixture and mix just until the dough is combined, about 10 seconds. 6. Carefully stir in the chocolate pieces. 8. Preheat the oven to 350˚. 9. Cover a large baking sheet with parchment paper. 10. Make 6 large balls of dough. They should each weigh about 3½ ounces. 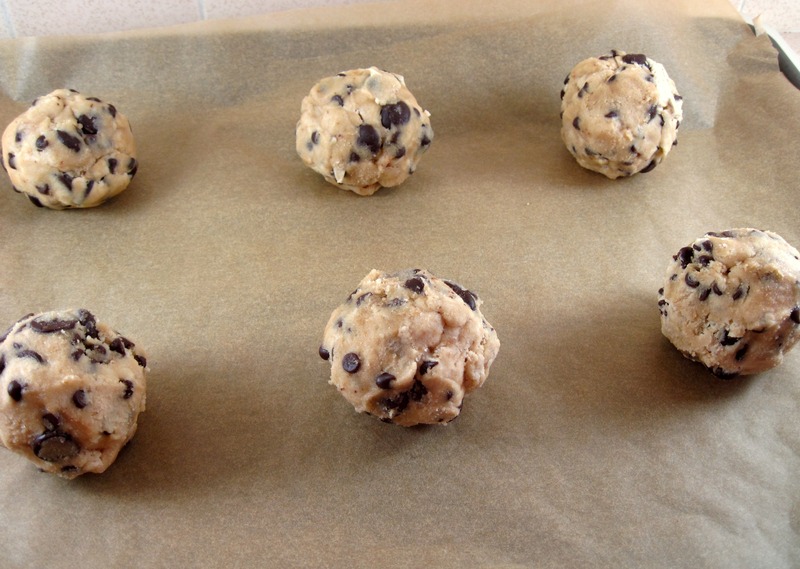 Arrange the 6 balls of dough on the baking sheet. 11. 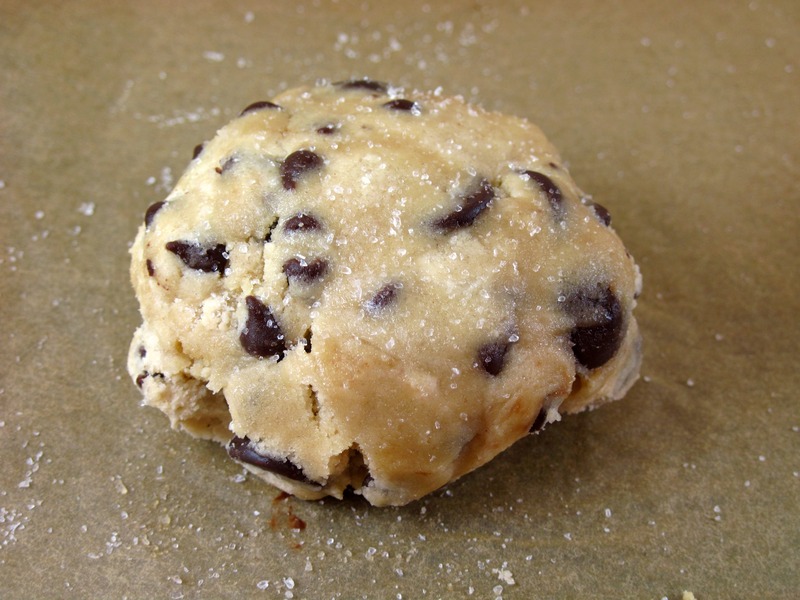 Lightly press the dough down a bit with the palm of your hand, and then sprinkle the cookies with sea salt. 13. Place the baking sheet on a rack to cool for 10 minutes. 14. Repeat with the rest of the dough, or cover it with plastic wrap and refrigerate to bake the next day. 15. The cookies are really best eaten warm as soon as they’ve finished their 10-minute cooling off period. We found, though, that they are still extraordinary after they’ve completely cooled down. Thanks for posting so blogworthy a recipe. Ah, yes, don’t we all seek perfection? I’m printing this now and will be off to pick up chocolate chips tomorrow. Phyllis, you will love this recipe! It is a classic! I’ll take a look at your sweets, Lisa! I can practically taste them from that first picture! 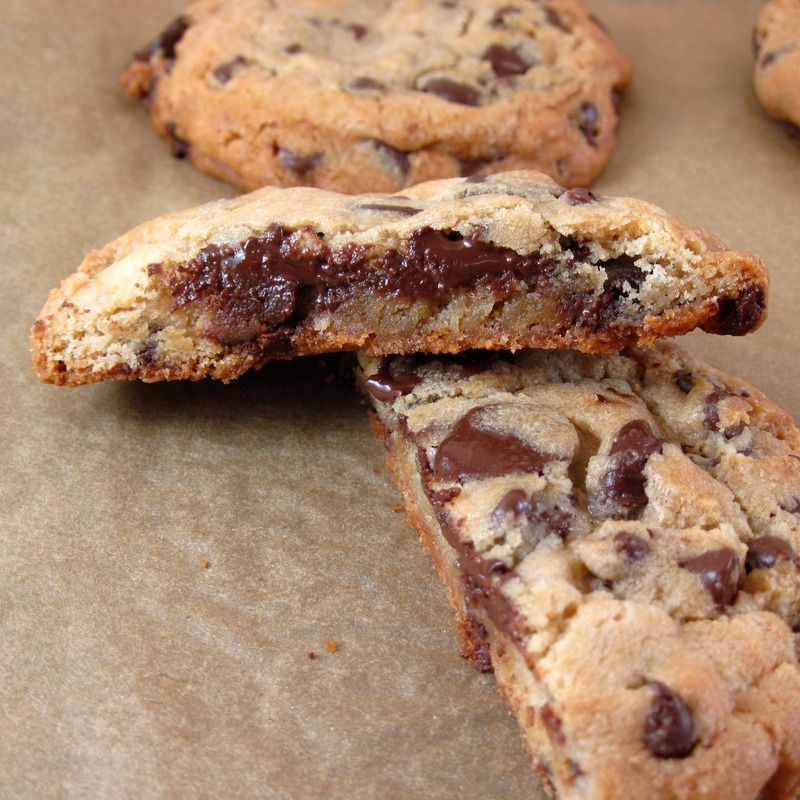 Chocolate chip cookies – such a classic! We are always on the hunt for the perfect cookie (especially choco chip). In fact, we were having a discussion this weekend regarding butter or margarine or shortening. I’m a purist so I am glad to see this recipe uses good ole’ fashioned butter! I am going to have to add this to my cooking list for next weekend. Thanks for a great post! I learned a lot. I love to hear that you learned something from my post! Thanks, Eliot! I am baking them (and eating them) NOW. They are the best! Aren’t they something? I wish I had one right now. Thanks for your comment! Ooh, just found this recipe and will be making it this afternoon. Chocolate in all it’s forms is a subject very dear to my heart – if you happen to find the perfect brownie recipe I’d be up for that too. The perfect brownie is my quest and I expect that search to take most of my life. In fact, I’d be disappointed if it didn’t! Nothing better than a warm chocolate chip cookie and these look amazing! We love these cookies, too! Yours look perfect (and I’m hiding the screen from my family or they’ll want another batch!!!). Thanks, Liz! They are wonderful! Another secret – Chocolate should never be heated above 52 degrees centigrade unless you’re baking it. It’s best to melt chocolate slowly to ensure a smoother finished product. Happy Baking! Oh my god these look amazing!! I definitely will have to try these out next time I make a batch of cookies. They sound too delicious to not do this very soon! I’m sure you won’t be disappointed, Lacy! my girls have always asked me for a good chocolate chip cookie recipe, I think I found it! Those cookies look amazing, I just wish I had a few to enjoy with my coffee this morning! Thanks for passing this along – I wonder if the chilling overnight is true for all cookie doughs? Certainly makes things simple if you’re entertaining. I have a friend who always keeps a batch of cookie dough in the freezer – that way the house smells like cookies whenever people come to visit. What a clever friend you have! I recently got Joanne Chang’s Flour cookbook, and I did notice that, “for best results”, she recommends an overnight chill for most of her cookie recipes. Amazing post!! I think we are in the search of a great choc chip cookie, the dough rest overnight and a sprinkle of sea salt. Thank you for sharing I am trying this out this weekend!! so excited! I haven’t made cookies in so long, and I’m craving them. I was busy baking cupcakes for the shower. Your cookies look amazing, as well as your pictures. I can’t wait to make the ooey gooey chocolate chip cookies. 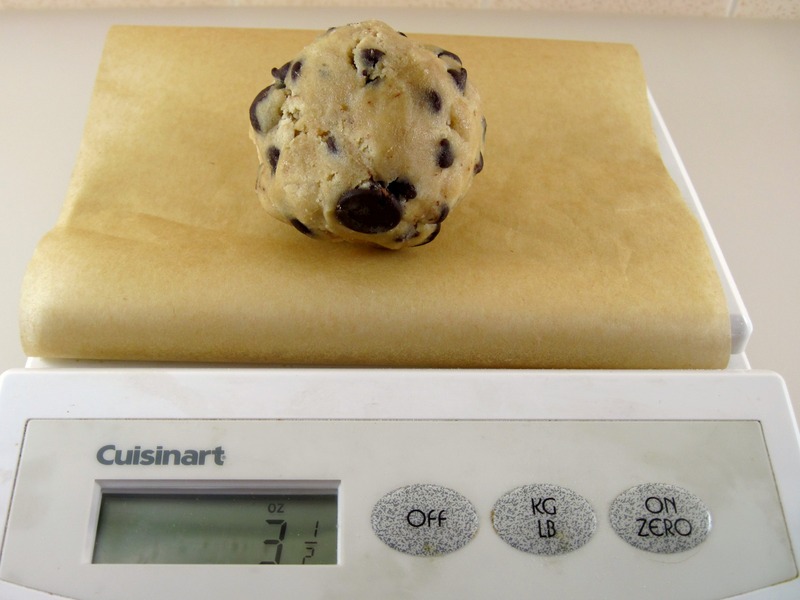 I agree…cookie dough needs to sit overnight. These look amazing and very similar to what I make. I may try this recipe tonight though! I am enjoying this with a cup of coffee in hand and an egg sandwich by my side. I hope you have a cool and relaxing Thursday. We are trying to beat back this heat in Austin! I know it’s been crazy-hot in Austin, Monet! No problem with that in Seattle; we’ve had highs in the low 70s and lows in the upper 50s. I’m wondering if you have any insight as to why the cookie recipe would use cake and bread flour? The cookies certainly were (sadly, past tense) fantastic, but I’m really curious about the scientific reasoning about the flour. Although my MIL’s chocolate chips cookies is very good but always would curious to try new recipes. The fact the you use cake flour and bread flour sounds very interesting. WOW these look awesome, thanks for sharing. Hell Yeah! It was just this morning that I have told a friend how long it has been that I made cookies. And now you come along with these. Jackpot! Second time I made these and they came out perfect again. Everyone who has tasted these cookies wants the recipe so it will go on my blog this afternoon! Thanks for letting me know how well they turned out for you, Ildi! I am testing alton brown, chewy, puffy, and Thin cookies, I want to try this I don’t think I can find cake flour here in kuwait, read about mixing corn starch with ap flour to make cake flour, I don’t know about taste though! I think you’re right. The bread flour probably does give them a bit more rise. I bet they are delicious, however! Ooh I’ve never heard of the New York Times cookies. Now I must try! I think you’ll love them, Angela! They are definitely worth the extra time!